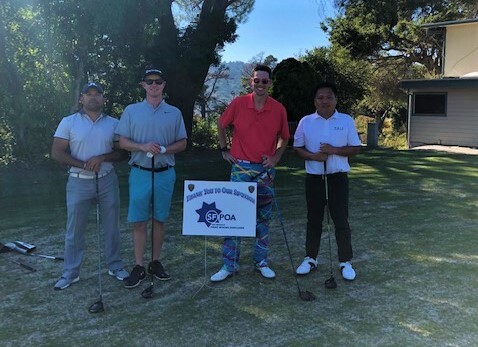 On Thursday September 20th, we hosted our Annual Golf Tournament at Crystal Springs Golf Course in Burlingame. The day was filled with sunshine and smiles as 92 golfers braved the tough golf course. The tournament not only serves as a chance for old friends to catch up with each other, but also as a chance to provide funding for our many programs PAL offers to the community. As every year, the competition was fierce and friendly. The tournament winners are: Daniel Faulkner, Reggie Pena, Bill Toomey, and Perfecto Barbosa. The closest to the hole win was taken by Reggie Pena. The long drive was won by PJ Jackson for the women and Blake Cunningham for the men. As always we thank everyone for coming out and supporting our organization. A huge shout out goes to all of our wonderful sponsors and donors who made this day a huge success: SFPOA, Northern California Carpenters, Boston Properties, Fog Harbor Fish House, PG&E, Rains Lucia Stern St. Phalle & Silver, PC, Priority Architectural Graphics, Gilson Team, IATSE Local 16, United Mechanical Service, San Francisco Building & Construction Trades, Towne Ford and many more. For more pictures of the event, please click here.